The British Government tried to suppress information of the massacre, but news spread in India and widespread outrage ensued; details of the massacre did not become known in Britain until late 1919. 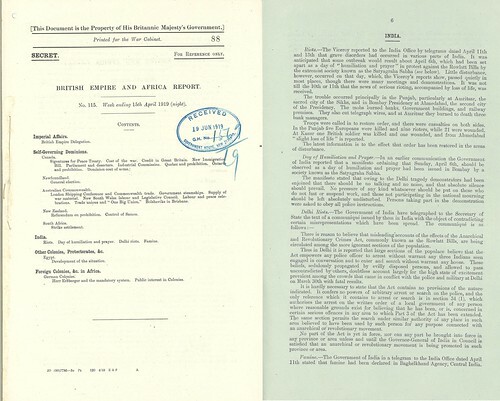 This report from the week ending April 15 1919 was sent to the Governor-General Of New Zealand, The Earl of Liverpool. It fails to mention the massacre though there is a reference to some loss of life. 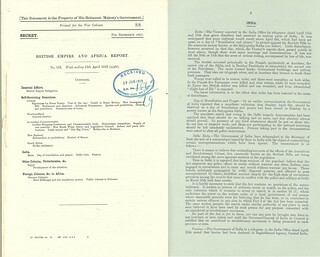 The reports received by the Governor-General included a summary of events from across the British Empire. Reports from September 1919 (www.flickr.com/photos/archivesnz/47574425581/in/dateposted/ & www.flickr.com/photos/archivesnz/47574426271/in/dateposted/) which were received by the Governor-General of NZ make reference to 301 deaths in Amritsar and outrage from Indian leaders such as Pundit Mahan Malaviya.